Our bamboo sliding panels are made from all natural bamboo for a great alternative to vertical blinds that is also eco-friendly. Each bamboo window panel track slider comes with a matching bamboo valance to hide the headrail and edge binding to protect the bamboo edges. Add a liner for additional privacy and light control. Optional wand control for child safety. 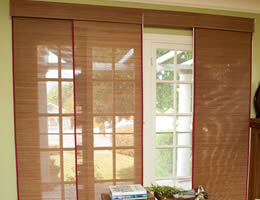 Note: Bamboo sliding panels are approximately 22" - 28" wide. This means there will be a stack of bamboo window panels on each side which they draw to. You will need to add additional width and use outside mount if you do not want to block any of the view through the window. Mounting depth will vary based on window size. Please see Features & Specs for complete mounting depths and panel configuration. If you ordered a sliding panel wider than 94 inches, the track will have been supplied to you in two pieces, with a splicing piece to join the two halves. Due to the nature of natural bamboo shades, each panel may expand differently and be slightly various heights. Heavy duty and very nice looking. Heavy duty and very nice looking. High quality. These are Nice Blinds, i was able to install them in 20 minutes, looks a little bit shorter in size but there was note saying it will stretch so will wait for now. Blind Chalet have clear measurement instructions, and it was pleasant experience, will highly recommend Blind Chalet to friends and Family. The quality of the sliding panels was wonderful. The quality of the sliding panels was wonderful. The bamboo looks very rich. I got it with the light filtering backing and I couldn't be happier. The customer service was excellent. The width of my type of sliding panel usually comes standard with four panels. I called and asked if it would be possible to get 5 panels. In 10 seconds I had a positive "yes" answer. The only complaint I might have are the installation instructions. Very vague, but you can figure it out. Because my window was 106 inches in width, they sent the panel track in two peices. It was a bit challenging to make the two peices exactly even so that the sliders would move smoothly across them. Overall I'm extremely happy with the qaulity and look. I had looked for something to replace my vertical blinds on my patio door. I had looked for something to replace my vertical blinds on my patio door. When I saw these bamboo sliding panels I knew I had found what I was looking for. I love the look, the quality and the ease of installation. These were very easy to install as well. These were very easy to install as well. The only thing we are a little concerned about is the track system. It came in 2 sections but nothing to connect the two in the middle. The panels get caught where they tracks connect because they don't match up "perfectly" and there was nothing given to us to connect the tracks to ensure easy sliding of the panels. Is there something you can provide us to correct this? 48"-84" One Way 3 Panels 3 Channels 2"
Center Open 4 Panels 4 Channels 2 3/4"
84 1/4"-120" One Way 4 Panels 4 Channels 2 3/4"
120 1/4"-144" One Way 5 Panels 5 Channels 3 3/8"
Center Open 6 Panels 3 Channels 2"
Minimum 2" 2 3/4" 3 3/8"
Flush Mount 2 1/2" 3 1/4" 3 7/8"